Two weeks ago we covered the 3 important things to know before starting a career in blogging, or just starting a blog in general. 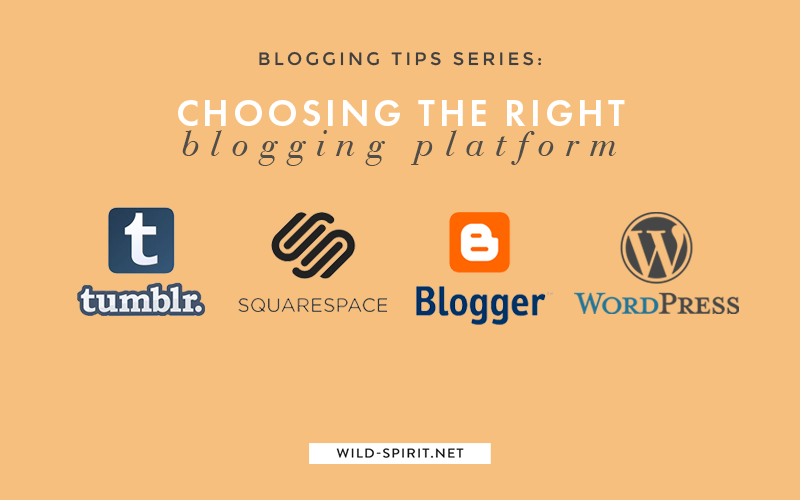 Let's move on to another important key factor: knowing which blogging platform you should be on. It's important to know because your blogging platform will act as your partner in this whole ordeal, you'll be working together constantly, and so a good match is of utmost importance. For this blog post, I'm choosing the top 5 main blogging platforms that people use nowadays (sorry Xanga and Livejournal! ): Wordpress (.com & .org), Blogspot, Tumblr and Squarespace. Personally, I've had experience using Blogspot, Tumblr and WordPress.org, but I've interviewed a couple of blogging friends who currently or have used the platforms I haven't so you can hear different opinions regarding each one, to of course help you decide better! Why did you choose to blog on Tumblr? I moved from Multiply (a photo sharing site) to Tumblr in 2009 when one of my favorite online personalities, Jac Vanek, started blogging on it. I loved Tumblr because it was a fun, micro-blogging, and sharing type community where you could totally be yourself. It's where all the weirdos, awkward, awesome, funny teenagers/adolescents gathered and shared a common love for all things art, music, movies, pop culture, photography, celebrities, and everything and anything under the sun you can think of. When someone wants to view your blog, clicking your blog link on their dashboard results in a pop-up of your blog's feed on the sidebar, instead of taking them to your webpage itself. This affects your blog traffic because visitors aren't taken directly to your site. If you want your own domain name, it will cost you a few hundred pesos/dollars a year. I interview Renz Bulesco, the blogger behind The Geek Travels, on his experience and opinions on using Blogspot/Blogger. Why did you decide on using Blogspot/Blogger as your blogging platform? I started blogging back in 2006 and I chose Blogger because I just heard it from my classmates. Although, I tried to transfer my blog on Wordpress and LiveJournal. The former was too complicated for my taste, while the latter was just… meh. So yeah, it was love at first sight. Blogger.com gives you an unlimited bandwidth, which is a good thing for bloggers who upload numerous hi-res photos on their blogs (see also: ME). More so, the photos are automatically uploaded on your Google+ album. Creating multiple blogs in one account. Blog layout and design. You don’t need to master the codes and the intricate language of web designing. Learning the basic HTML and CSS is already enough since Blogger allows its users to just drag and paste the widgets on their blogs. Blogger is a secured site. No need to install security widgets since Google in the first place is a secured website. I haven’t heard anything about someone who tried to hack Google, have you? Account integration - no need to sign in/sign out when you visit Google+, YouTube, Gmail, and other Google services. Saves time. You can’t have it self-hosted unlike Wordpress since it is owned by Google. When your blog’s self-hosted, you all have the freedom to tweak the codes, plugins, and themes that will enhance your site in many ways. Blog templates. I’m quite satisfied with my layout thus it’s not an issue for me. But yeah, layouts and templates for Blogger are limited unlike Wordpress. Widgets and plugins are also limited compared to Wordpress. Any tips for bloggers who are looking into using Blogspot? Blogger is the best platform for starters,or those who don’t want to spend too much on hosting and other maintenance cost. I've never used Squarespace so I approached Corinth Suarez of Explore with Corinth for her opinions of using the platform for her blog. I was looking for a new blogging platform because I decided it was time to say goodbye to Tumblr. I found out about Squarespace through the people I follow on Instagram. I tried it out and I loved it! It's the blogging platform I've always needed/wanted. Squarespace is just so clean and modern and it's always getting better. There are only a few themes you can use, compared to Tumblr and Wordpress or Blogger. It's very limited to my needs also it's hard to mess up with the css. But if you know your way around codes and all about being unique, you can make your theme reflect YOU. Any tips for bloggers looking into using Squarespace? My only tip would be to have patience with it. At first, it would look so weird and different that you won't know what to do with it but after a while, you'll get the hang of it and be able to blog with ease. Also, I suggest that you take advantage of their 14-day trial. It will give you time to mess around with Squarespace first, without having to pay them right away. By the time the free trial period expires, your website will be ready and live! What made you decide on using WordPress.com? I chose WP because based on my personal experience and exploration of blogging platforms, it's the best FREE platform there is. 2.1. Ease of use: It's the simplest thing to navigate through your dash. All the buttons you'll need are easy to find. On the right of your nav, you have a button to create a new post, one to update your profile, and one to view notifs. On the left, there's a button to manage all your listed WP sites. Comprehensive stats: When you click on the My Sites button, you are directed to a page that displays comprehensive stats of each of your WP sites. You can view the number of unique views and visitors, likes, and comments for a specific day, month, or all time. You can see the number of visitors per country too, which is sweet cause you get an idea of the reach of your site. Aside from these, there are a whole lot more stats you can track. Connectivity. Upon login, you are directed to the Reader, which is a timeline of the blogs you follow. You can toggle options to view blogs n Freshly Pressed, or to find recommended blogs. You can even follow tags! This makes it easy to find bogs which are similar to yours, and people you can befriend to exchange ideas with! WP Publicize: WP includes your Twitter followers and Facebook friends/followers to the total number of your blog's followers. 3.1. No third party ads: Wordpress.com doesn't allow the use of third party ads like Google Adsense of Nuffnang. 3.2. Limited customizability. Since its free hosting, there's not much you can tweak. What you see is what you get. To customize stuff, you'd have to go premium. Limited storage: Yu only get so much free storage. At first this figure will seem enough, but once you have a lot more content on your site (especially media like high res images), you'll find that a couple of gbs won't cut it. For additional storage, again, you'd have to go premium. Any tips for bloggers looking into using WordPress.com? READ THE FINE PRINT. It's easy as pie to set up a WP account and construct your blog, and you can post your first stories with your eyes closed. But before you get into all that, before you tick that "I agree to the terms" option, make sure that you take the time to read the them.Keep an eye out for: "By submitting Content to Automattic for inclusion on your Website, you grant Automattic a world-wide, royalty-free, and non-exclusive license to reproduce, modify, adapt and publish the Content solely for the purpose of displaying, distributing and promoting your blog. ""Automattic has the right (though not the obligation) to, in Automattic’s sole discretion (i) refuse or remove any content that, in Automattic’s reasonable opinion, violates any Automattic policy or is in any way harmful or objectionable, or (ii) terminate or deny access to and use of the Website to any individual or entity for any reason, in Automattic’s sole discretion. Automatic will have no obligation to provide a refund of any amounts previously paid." What made you decide on WordPress.org? Freedom and control over your entire website -- from themes, to plugins, to widgets, to making certain parts of your blog appear on specific webpages, adding a shop, adding a welcome page, etc etc. Any tips for bloggers looking into using WordPress.org? Learn to explore. If you don't know what self-hosted means, I suggest you Google it to your hearts extent and really familiarize yourself with it. It is YOUR job to know how your website will work, not your host. Your host's only job is to host your website but everything else from installing plugins to editing some html/css/php, that is all in your hands. Also, if you can't afford to get WordPress.org right now, THAT'S OKAY. You can start with WP.com, Blogger, or even Tumblr, and when you're reading to make the switch to WP.org, you can always import your blog posts. As of April 2017, I myself have made the move from Wordpress.org to Squarespace. You can read all about it here.